Background, causes and how to handle this error. When you create a deposit for a booking in Preno, a prepayment is created in Xero. 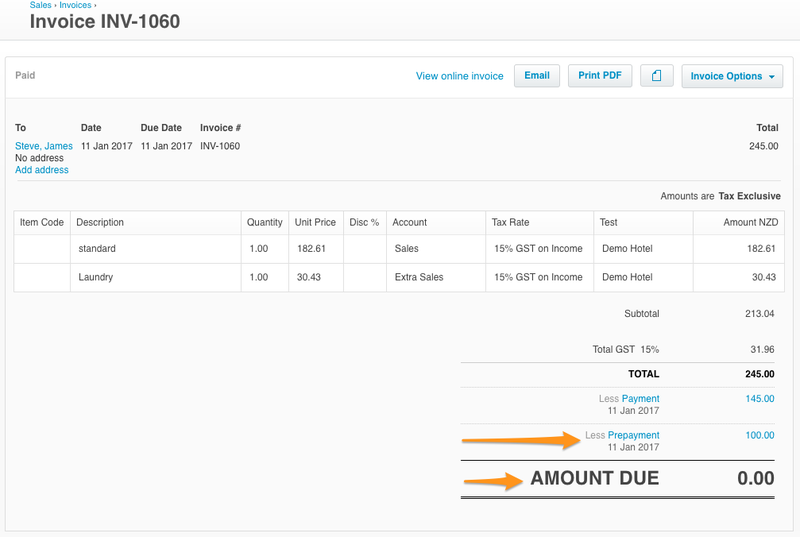 This prepayment is credited against the full invoice that is generated at checkout, but this error occurs when the value of that credit has been altered in Xero and does not match. The variance prevents Preno from being able to apply the prepayment to your final invoice, and the booking cannot be checked out. You'll see that Preno creates the final invoice, but there are no payments applied to it. Create the guest's invoice - this has the different line items (accomodation, extras) and price. Find the prepayment that Preno created, and credit that against the invoice that was just created. Create and apply any extra payments that were entered in Preno. The end result of this is for the invoice to have a $0.00 amount due. The booking has been rolled back to a pre-checkin state, and the old invoice has not been deleted. The prepayment has been edited in Xero to have a different amount. Some, or all, of the prepayment has been has been applied to a different invoice. You'll need to do some work in Xero to fix this. Either find the prepayment in Xero, or open it up by clicking on the payment from the booking in Preno. Once you open the prepayment, you'll need to click on the INV-# for the prepayment. 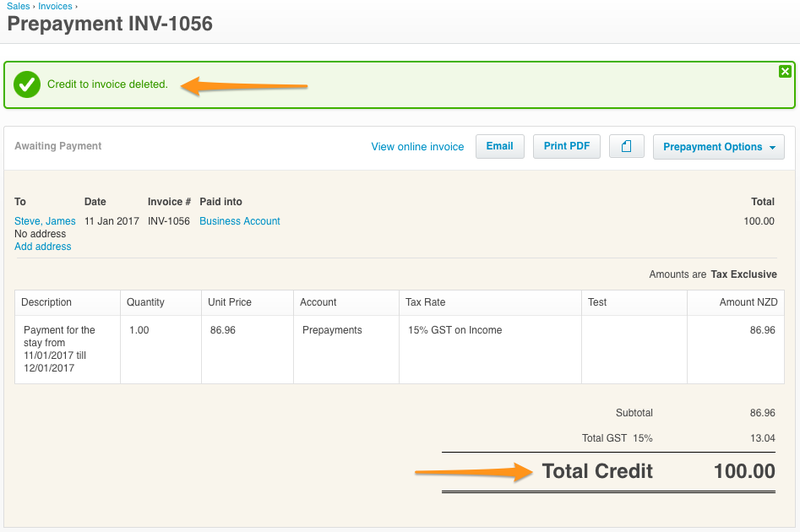 Once you click on it, you'll be able to see the credit note, and the old invoice that the prepayment was applied to. Click on the little cross on the right hand side of the credit. 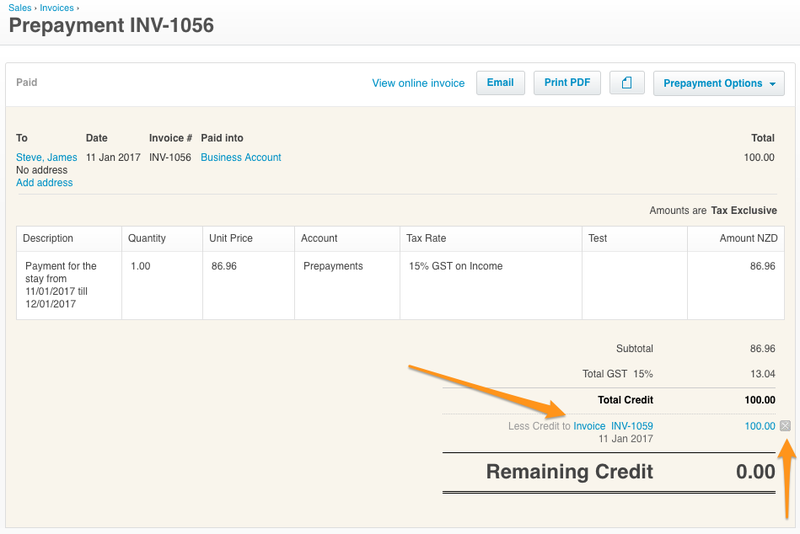 Xero will confirm that you'd like to delete the credit allocation - click OK.
You'll receive a confirmation that the credit to the old invoice was deleted, and the page will now change state to say that it's Awaiting Payment, and the Total Credit should be for the entire amount of the prepayment. By doing this, you've now unlinked the prepayment from the old invoice. You've returned credit to the prepayment, so now Preno can apply it to the new invoice that's going to be created. If you can still see both the View full invoice and Check out links at the bottom of the booking, then click Check out again. You can now checkout the guest, and the error will not occur.